Thanks for checking in with Flawed yet Functional today! My husband is Korean, and Korean food is deep in his roots. We love love love kimchi, sticky rice, bulgogi, jopchae, and all other Korean delicacies. Alas, most of these foods are not Paleo, and definitely not AIP, compliant. If there’s one thing we miss with our current lifestyle, it’s Korean food. However, I’ve made some changes to traditional Korean Chicken soup to make it AIP compliant. Think of this soup as the Korean version of American chicken noodle soup. It’s our go-to soup when we’re sick, a delicious comfort food! Made with a whole chicken plus 3 ingredients, this soup is extremely easy to make and yet bursting with flavor. You will be amazed how good it tastes with such a humble ingredient list. The core soup recipe requires no alterations to make it Paleo and AIP friendly. Simply submerge the chicken in water and add the ginger, garlic, and dates to the water and simmer for 1.5 hours. So simple! Traditionally, the soup is served topped with fresh chopped green onions and a bowl of sticky, white rice on the side. The chicken would be whole in the broth, and you would use chopsticks to pull the meat from the bone and grab a bit of rice for each bite. There also would be a bowl of extra sesame seeds, salt, and black pepper by your rice bowl to dip each piece of chicken in. Yum! Just a few adjustments make this healing soup friendly to the leaky gut and a bit easier to eat. First, make cauliflower rice to replace the sticky rice. Now don’t go into this thinking the cauliflower will taste like rice, it won’t. The cauliflower serves as a low-carb filler to make the soup more hearty. If you don’t like cauliflower rice, just skip it and eat the soup plain! It will still be delicious. 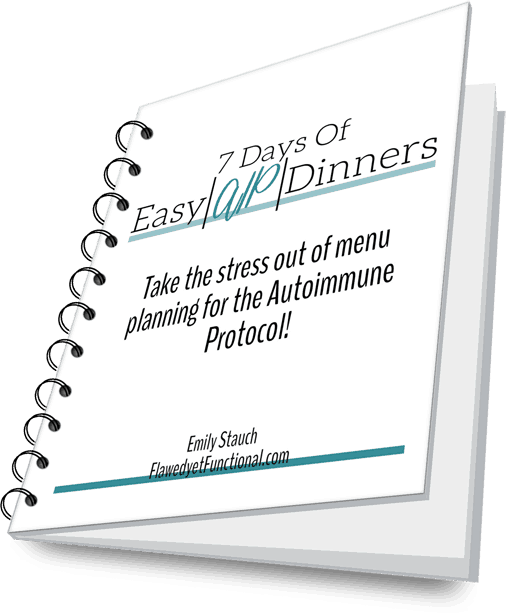 Second, if you are still in the elimination phase of the Autoimmune Protocol, then leave off the sesame seeds at the end. The rest of the soup fits right into the AIP elimination phase. Third, combine everything into one bowl to eat. 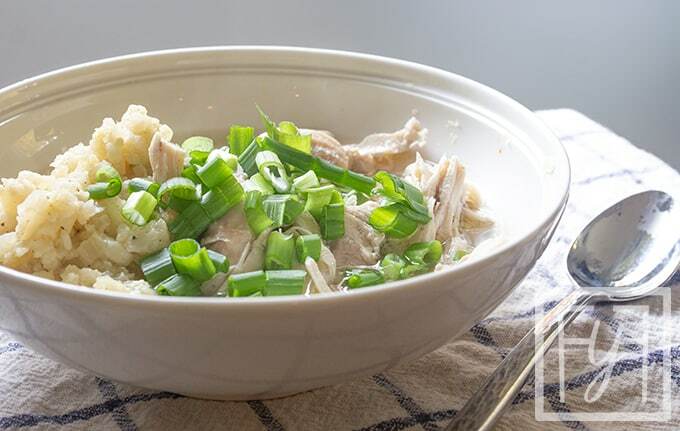 Put a spoonful of cauliflower rice into each bowl, pour the broth and shredded chicken on top then add green onions, sesame seeds, and pepper, as your diet allows. Use a dutch oven that snugly fits your chicken. I like to use an 8 quart soup pot and fill the water to just covering the chicken. However, I have used my 6 quart cast iron dust oven, but I had to flip my chicken every 30 minutes because the water level couldn’t get high enough to cover the chicken completely. Don’t sweat it if this is your issue! It will turn out, just keep cooking it until the entire bird reaches 165° internal temperature. Shred the chicken then return to the broth and adjust seasoning. Feel free to toss in some salt and pepper while the chicken is cooking, but do the bulk of your salt and pepper seasoning at the end. The soup will need a very generous amount of sea salt. I add around 2 tablespoons. Your salt may be a different coarseness than mine, so begin with 1-2 teaspoons and taste. Continue to add 1 teaspoon at a time until the chicken flavor brightens and pops. You will know what I mean if you taste after every addition. If the soup tastes bland or boring, add more salt! Korean Chicken Soup is a mainstay in our house when any of us is feeling poorly. There’s just something about chicken soup, isn’t there?! It’s good for what ails you! Give this AIP and Paleo-friendly soup a try next time you are under the weather. You will find it soothing and comforting, I’m sure! Enjoy! 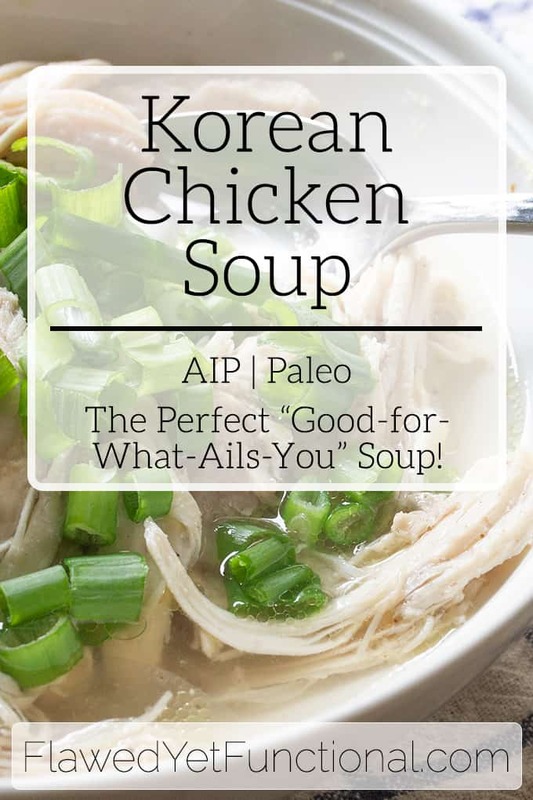 AIP and Paleo spin on traditional Korean Chicken Soup. It's delicious during those times you are under the weather or just hankering homemade chicken soup! Rinse chicken under cold water and place in dutch oven that snugly fits the chicken. Cover the chicken in cold water and add ginger, garlic, dates, and 1 teaspoon of salt to water. Cover and bring to a boil. Reduce heat to medium or medium-low to maintain a simmer for 1.5 hours. Add extra water as needed to keep chicken covered during the cook. Prep the cauliflower rice ingredients: chop the onion, mince the garlic, and rice the cauliflower. For the cauliflower, I chop into florets then I work in batches using a low speed on my blender to chop into very small pieces. When chicken is finished, pull chicken out of pot and let rest on a plate or pan to cool a bit before shredding. Remove ginger and discard. Feel free to leave the garlic and dates to eat. They are delicious! Meanwhile, start the cauliflower rice. Heat a large skillet over medium heat. Add olive oil to the pan. Add onions and saute until just beginning to soften and brown. Stir in garlic for 30 seconds until fragrant. Add riced cauliflower, 1/2 teaspoon of salt, and 1/4 teaspoon of pepper. Fry for 30 second to 1 minute. Stir in water then cover and cook for 5-10 minutes or until softened, stir every 3 minutes or so. When softened, taste for salt and pepper and season accordingly. While cauliflower is cooking, shred the chicken and return the meat to the broth. Turn the heat back on to medium to warm up. Taste for salt and pepper and adjust. Soup will likely need 1-2 tablespoons of coarse sea salt and a whole bunch of freshly ground pepper. To serve, place a good spoonful of cauliflower rice in a bowl and pour chicken soup over it. Top with diced green onions, sesame seeds (Paleo only), and more fresh pepper, as desired.